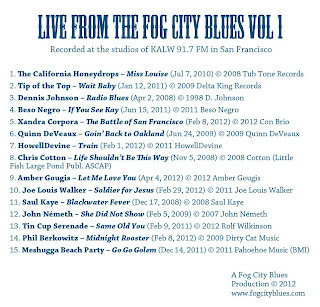 A little over a month after the KALW membership drive for which it was created, the CD exists: Live From The Fog City Blues Vol 1 compiles the best live-on-the-air performances of original material by Bay Area musicians from the program's first five years. It's available at www.fogcityblues.com. Cover design and artwork by my wife Andrea -- though be sure to picture the bottom image as a clear sticker on a recycled-paper sleeve more or less the color of the top image. Trust me, it looks awesome. Although there turned out to be just the right number of locals-playing-originals for an hour-long set (more on that later), the concept of this compilation goes back a few years. It began New Year's Eve 2008, which fell on a Wednesday, which meant I'd be on the air, with a need to do something special. The program was just about two years old at that point, and a New Year's Eve broadcast seemed like the right opportunity for some sort of retrospection. In-studio performances were rare in the show's first year on the air, but by 2008 they were happening more frequently, and so I compiled and played an hour of some of my favorites. And then headed out to whatever New Year's party I was due at. Fast-forward a few months to the 2009 spring pledge drive. It occurred to me that instead of offering some commercial CD as a thank-you gift, I might try to use the work I'd done for that New Year's Eve special to put together an album of live-on-the-air performances, as a truer representation of the show's value (to me and, hopefully, to listeners). The folks at the station were relatively receptive, so I set about figuring out what needed to be done. That turned out to be mostly a matter of permissions – from the performers (either directly or through their record label), and in the case of non-original compositions, from the music publishers. And ay, there was the rub. Given what had been played live in the Fog City Blues studio up to that point, it was going to take some work to get clearance for some of those blues standards (whose copyrights were held by entities with few reasons to accommodate my endeavors) needed to flesh out the disc. I did reach out and get permission from a few folks -- including an early conquest on the show, the Canadian band whose music I'd been following longer than any other active musicians, Blue Rodeo -- but not enough to get the project off the ground. And so we went with the new CDs from two recent visitors to the show, Chris Cotton and John Németh, as thank-you gifts. Not too shabby, but alas. The idea was floated now and again over the next couple of years. But KALW's membership drives were evolving, eventually hitting on a thank-you-gift-less format that as an on-air personality I certainly had no qualms with. It was with the fifth anniversary of the show this year that the idea became viable again, for a number of reasons. 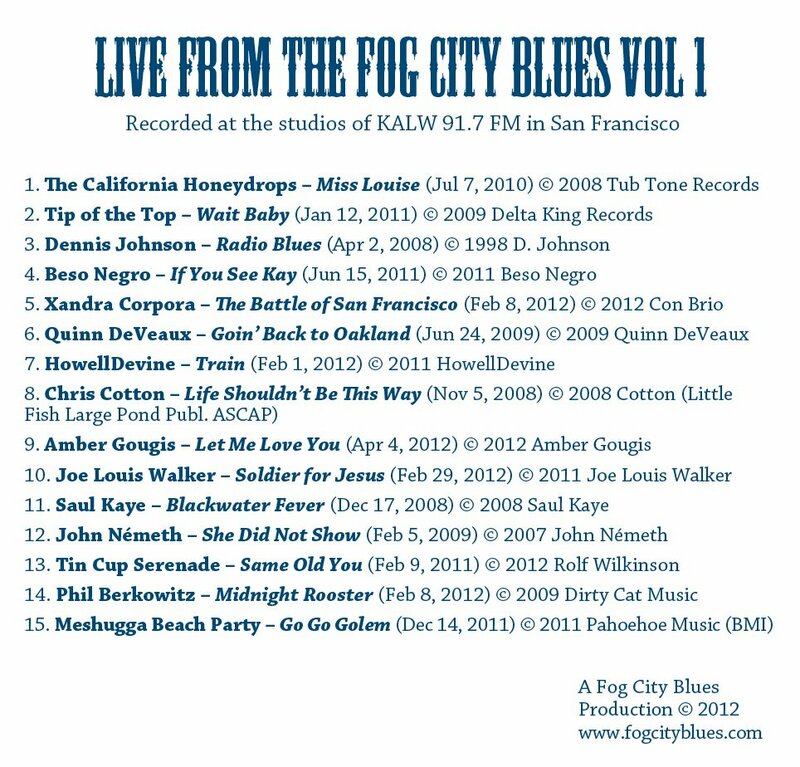 First, having somewhat hastily put together a special program for the on-air fifth anniversary in January, I decided to revive another idea from over a year prior (actually, my wife's idea) to put on a live event -- a "Fog City Blues Revue" -- with some of our favorite local bands playing short sets at a local venue. With a little help from my friends and her, that came together in May for a slightly belated "Fifth Anniversary Revue," by which time I'd learned that KALW's spring membership drive would be a touch old-school -- still interruption-free ("No programming was harmed in the course of this pledge drive"), but we would be bringing back the bevy of thank-you gifts. The stars were aligning. With five years on the air there had to be enough in-studio performances of original songs to dispense with the covers; there would be no seeking of separate publishing rights. And if that were the case, maybe we could make it hyper-local -- Bay Area musicians playing Bay Area blues. Of course that meant abandoning some great music played on the show: the Chicago purists, the Delta revivalists, the Gypsy jazz bands (local as well as fresh off the plane from Europe), not to mention those sentimental favorites from my home & native land, Blue Rodeo. 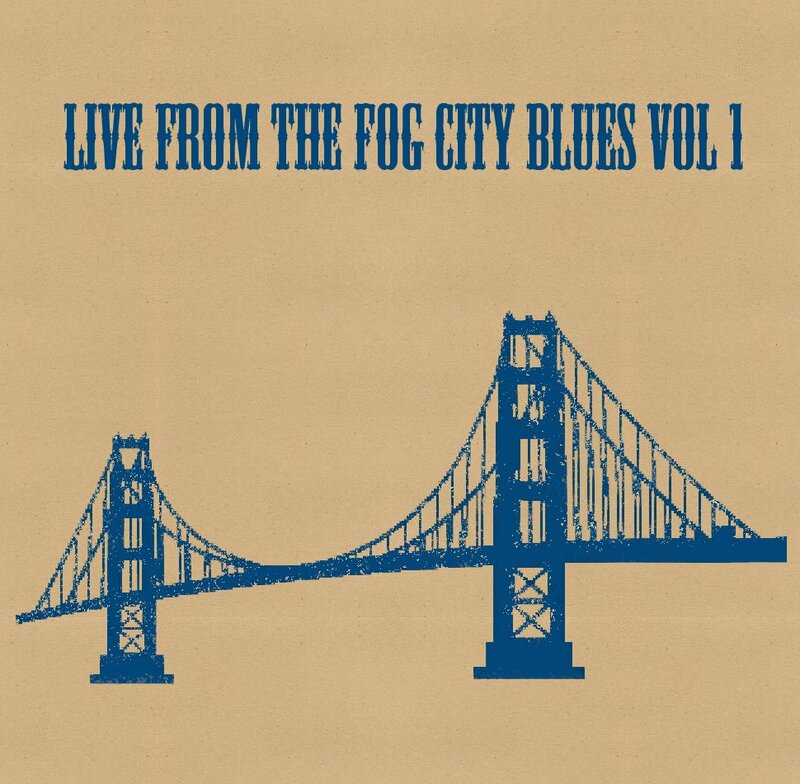 But by creating a self-limiting set of justifiable criteria, I could leapfrog over a lot of unsatisfying decision-making, and... voilà: Live From The Fog City Blues Vol 1. But of course it wasn't just voilà. Not only was there was some technical tweaking to do, but the sequencing became all-consuming -- after all, that's the essential creative work that goes in to every episode of Fog City Blues. Which track to open with? What kind of balance between solo and band performances, moody versus uptempo tunes? Group the harp players together or spread them out? Which track worked best as closer -- and which one worked best immediately before it, to heighten the drama? What story would this tracklist tell? In the end in took a couple of iterations, with input from trusted auditioners, along with a healthy dose of telling myself, more than once, "Good enough." It's just part of the story of blues in Bay Area as heard on KALW. Especially without a track from Blue Rodeo.